One hears so much about the detachment necessary for sanctity that it is refreshing to read about someone beatified who unblushingly loved her family, her country, her friends, and all little children. 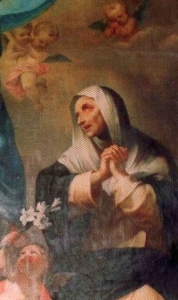 Magdalen Pannatieri was born at Trino, near Vercelli, in 1443, of deeply religious parents. She was a devout child, who made a vow of virginity while she was quite young. Before she was twenty years old, she took her vows as a Dominican Tertiary, an exceptional circumstance, showing that she was held in high esteem. The Tertiary chapter was made up principally of widows and older woman who centered their apostolate of active charities around the Dominican Church. Magdalen fitted into this work with ease, and she brought to the chapter a spirit of penance that few of her companions could match . The delightful part of it all was that her penances never rendered her dreary; she was a cheerful, resourseful person to have around. People drew as much good from her spirit of joy as from any other feature of her spirtuality. Magdalen had a special fondness for little children, and what we now call baby-sitting, and used her influence witht he children to bring their parents to a better way of life. Childless women won her sympathy , and several times her prayers brought the blessing of motherhood to such people. She taught catechism to children, and gradually the older folk of her acquaintance began to sit in on her classes. She was quite unaware that she had great powers of description and could make the truths of religion clear to simple people. The Dominican fathers allowed her to use a large room attached to the church for a class room, and the class grew. Not only the parents of the children and the simple folk of the neighborhood, but also a number of priest and religious were attending regularly. When the reform movement started by Blessed Raymond of Capua got underway, Magdalen Parnatieri promoted it in Trino. Though her influence, Blessed Sebastian Maggio was invited to preach there, and he accomplished great good. Magdalen was considered the protectress of the city of Trino. Whatever disaster threatened it, the citizens expected her to look out for their interests, and she usually did. In her life there is no mention of a “dark night of the soul” or of grim detachment from all things of earth. Her love of God kept her from attaching herself to any illegitimate pleasures, but she thoroughly enjoyed the lawful ones- she loved her family and her townspeople and was happy in their company. Her favorite brother was a good-for-nothing- he was always in trouble. When his conduct had gone beyond the patience of everyone but Magdalene, she threw herself on her knees in front of her crucifix, and she stayed there until our Lord assured her that He would take a hand with the black sheep: ” I cannot refuse you anything,” He said. The Dominican fathers received her solitude when they were persecuted by a wealthy man of the town. This person carried his hatred so far that he was finally excommunicated for persecuting the Church. there was of course, a good deal of blood shed before the affair was over, and one of the reprobate’s followers made the mistake of hitting Magdalene and calling her names. Before the irate townspeople could deal out justice to him, God did; the man died a violent death. God revealed to Magdalen the coming political troubles of Italy: the French invasion of the country. She did not live to see this prophecy accomplished, but she persistently asked God’s mercy for her people. During the violent quarrels and bloodshed of the time, Trino was always spared, though the villages all around were in a shambles. The townsfolk unhesitatingly gave credit to Magdalen.